Abies concolor 'Masonic Broom' is a very scarce and extremely choice selection of White fir that grow as a tight, compact little flat-topped bush with knuckled branchlets of grey-Blue needles that are a little smaller than those of the species. After 10 years, a mature specimen will be only 2.5 to 3.5 inches (7 - 8 cm) tall and 8 inches (20 cm) wide, making it an excellent choice for a xeric rock garden. This cultivar originated in 1978 as a witch's broom found on a specimen of 'Compacta' at a Masonic Home in Pennsylvania by Joel W. Spingarn of Baldwin, Long Island, New York and introduced to the nursery trade by Ed Rezek and Hillside Gardens, Leighton, Pennsylvania, USA. 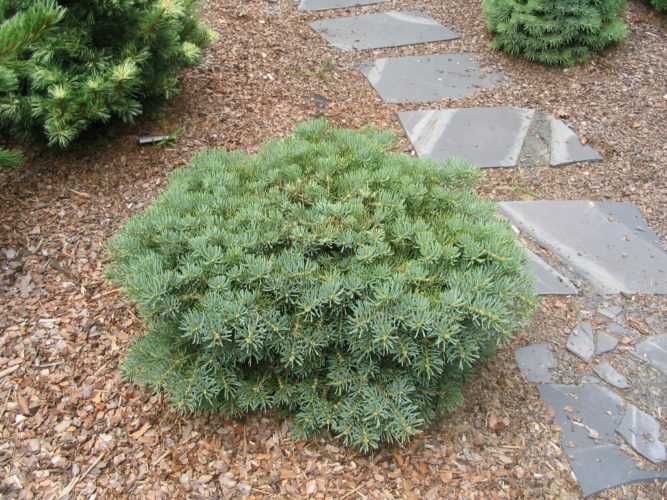 Abies concolor 'Masonic Broom' — a nearly perfect mature plant. 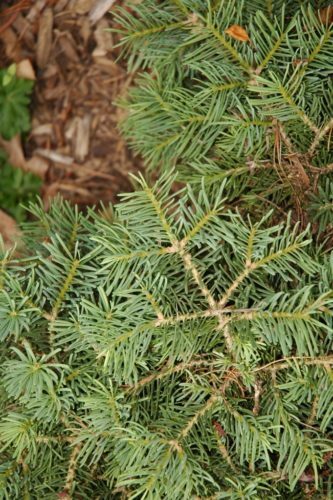 Abies concolor 'Masonic Broom' — a closeup of foliage detail.